Spring is quickly transitioning into summer, and while the weather is heating up and the kids gear up for the upcoming “outdoors season”, the occasional rainy day still brings up the classic question: what can we do as a family while trapped inside the house, waiting for better weather? There are a number of different things that can be done to pass time on rainy spring days! I have provided a list of some of my favorite things to try out below! A classic rainy day activity. For younger kids, there are always the classics like snakes and ladders and candyland. These are great ways to teach kids a little bit of math (counting squares counts as math, right?) while having some fun. For older kids, games like risk can take up a whole afternoon, as your family turns into a little UN and the diplomatic negotiations start. Board games are an easy way to get the whole family around the table for some wholesome fun! With the advent of streaming tv and movies through apps like Netflix, marathoning visual media has never been easier! Pop some popcorn, pick your favorite series of films, and cozy up with the family to watch some movies and those rainy days will fly right by. A new fav for me and my family, colouring sheets can be printed online (there are a ton of great resources online for free printable colouring sheets). Crafts can also easily be found online, and many can be made with stuff you have lying around the house! 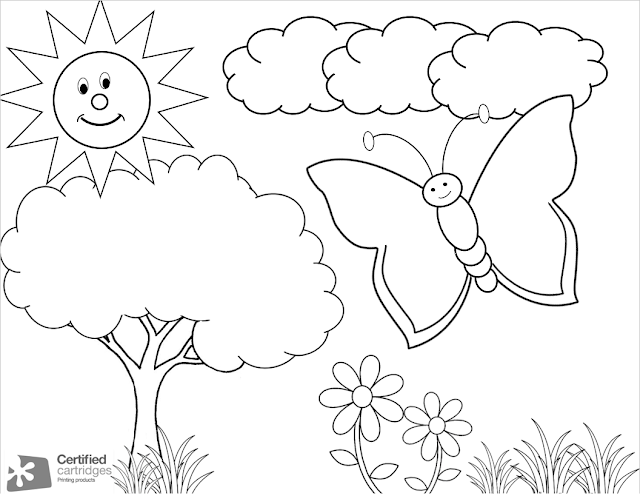 To start you on your colouring adventures, Certified Cartridges have provided this spring themed printable, if you are looking to kickstart your new favourite rainy day hobby!